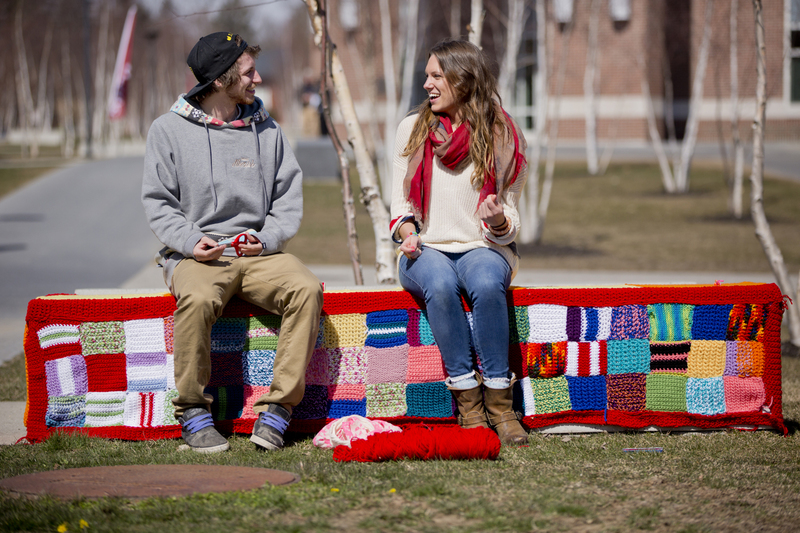 Julia Foxworth ’13 of New York City, at right, spent much of April 5 “bombing” a bench on Alumni Walk — yarn bombing, that is. Aka “guerrilla knitting” and “grandma graffiti,” yarn bombing is a genre of street art designed to raise awareness of the community environment, and inspire conversation and collaboration. Seeking to bring color and warmth to a concrete bench during a time of year that’s drab, chilly and stressful (finals are next week), Foxworth crocheted the piece with the help of 15 collaborators. The piece was welcomed with simultaneous cries of “That’s so cool!” from passers-by. With the guidance of associate professor Pamela Johnson, art and visual culture major Foxworth undertook this project as an independent study complementary to her art history thesis. After Bates, Foxworth is off to a master’s program in arts administration at Columbia.